Mobile users, beware: you’re being watched — constantly. An Android developer claims to have discovered an app that comes pre-installed on millions of Android and BlackBerry handsets, that records all activity on the device. That includes calls, location, and every key pressed on the device. Update: Nokia says that reports that this software is installed on its devices is incorrect, and that the software won’t work with their systems. The app, created by California-based software company Carrier IQ, is shown in a video posted to YouTube (see below) by developer Trevor Eckhard logging every key he pressed, in real time. The software even recorded Eckhard’s geographic location, when connected to Google via Wi-Fi — not 3G — even though he denied permission for Google to track his whereabouts. Calls aren’t safe, either. The company also denied that the software transmits user data in real time. So when Eckhard dubbed the software a “rootkit” — a term typically associated with trojans and other malware — Carrier IQ threatened to wage a legal battle against Eckhard. The company quickly pulled off its dogs, however, after the Electronic Frontier Foundation came out in support of Eckhard’s claims. 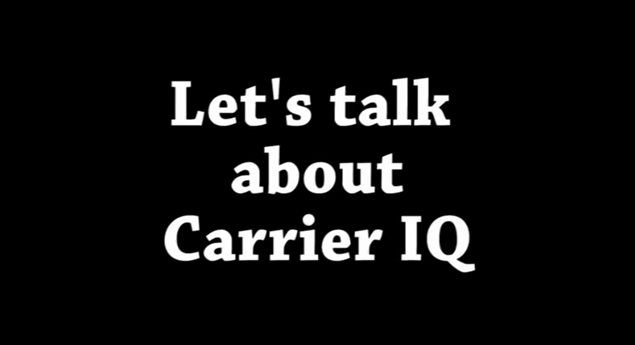 Carrier IQ also denies that its software records keystrokes — a claim obviously refuted by Eckhard’s video. The only way to rid your device of Carrier IQ’s invasive monitoring software is to completely wipe your device, and reinstall it with a new operating system. This is, of course, not the first time we’ve learned about our mobile devices betraying our private data. But it doesn’t make it any less troublesome, this time around.